Are you a family who wants to transform your backyard for play? Are you part of a school or community group, ready for an engaging outdoor space? Are you from a parks department or municipality looking to build a nature play park? Are you looking for an inspiring speaker, teacher, trainer? Is your design or development firm looking for expert advice, design consultation, or collaboration on including nature play and learning spaces in your project? Create Your Own Outdoor Magic! Play is children’s work. It’s how they learn. Children who have opportunities to play and to experience joy in nature, to have adventures and to feel in charge of their outdoor space grow up to be healthy, caring citizens of the planet. Children are less connected to nature today than in the past for many reasons. Our intuition (and a growing body of research) tells us that this disconnect has a cost – children who are sick more often, rising stress, depression, and obesity levels and even an increase in vision problems. Nature is the answer! When children have time to play in nature, they are stronger, healthier, more confident, coordinated, imaginative, and focused, and all around happier. Because children today are less likely to have the opportunity to roam free, we bring nature to the places where children spend their time: backyards, schoolyards, churchyards, parks, and early childhood settings. Let us help you create a beautiful and adventurous natural play space. With a deep respect for the magic of childhood, a time-tested process that brings together the whole community, a commitment to sustainability, and decades of experience Nancy and her team of skilled and experienced contractors, artists, and experts can help you make your vision for children a reality. It’s what we’re passionate about. Creating sustainable natural play and learning spaces is the way we help to make the world a little greener, a little healthier, a little kinder, and a lot more fun. EarlySpace creates places that heal people and the planet. On our old playground the children rarely engaged. They had to struggle with aspects that were developmentally inappropriate. The playground was not aesthetically pleasing and how no flow. The teachers often complained of a lack of things to do on the playground, children tripping, etc. Nancy created a design for us that considered every aspect of functionality and comfort and seamlessly intertwined them within a natural playscape. Her vision and design were both stellar. The entire area now feels serene and peaceful. The children are much more engaged on the playground and can be observed engrossed in a variety of exploratory activities. The playground is much more functional for the teachers and includes many elements to make extended outdoor time possible. This playspace is now the grand finale of our building tours! Prior to working with Nancy, our school was committed to constructing a natural playspace but we needed a design that could meet the Chesapeake Bay Ordinance, our county’s stormwater mitigation requirements and the Department of Social Services child care licensing regulations. 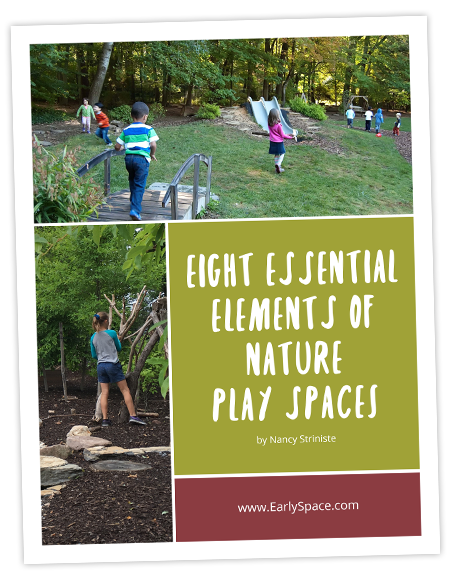 Working with EarlySpace was a huge benefit for MSNV because Nancy was able to negotiate with all respective authorities and answer questions, attend meetings, as well as be on-site through the construction process.